Steve's long-awaited new book has been released. 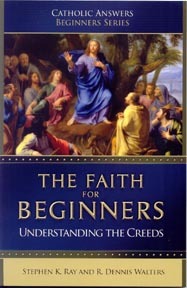 Faith For Beginners: Understanding the Creeds in the Catholic Answers Beginner Series written with Dennis Walters. The Apostles’ and Nicene Creeds are prayers most Catholics take for granted. We pray them by rote when we say the Rosary or go to Mass—often without thinking about, fully understanding, or even truly believing what we’re saying. And providing you with this understanding is what The Faith for Beginners is all about. It’s a fascinating romp through the history of the Creed, closely examining what we believe and why—with references to Scripture, the Church Fathers, and Church Councils. For Steve's 32 page booklet on the Creeds, click here. For Steve's web store, click here.